LESLIE’S WEEK provides vacations away from cancer for Stage 4 Breast Cancer women and their families. Our goal is to have our families create Memories that Outlast Cancer. We began with a collection of vacation homes in the Great Smoky Mountains of Tennessee and have expanded LESLIE'S WEEK to include the 5 star Dollywood DreamMore Resort and a reserved SPA Day of Beauty for each Stage 4 Breast Cancer women. We offer 2 discussion forums, CIRCLE4STAGE4 & CARE4GIVERS, and the CLUB4KIDS Art Expression experience for our LESLIE'S KIDS. This program began in 2011 in coordination with Leslie’s nurse, Carol, at the Kimmel Cancer Center, who identified one family candidate in 2011 & 2012 for LESLIE’S WEEK. Our outreach extended and now includes nominations on our web site and families who are selected by third party Breast Cancer Centers throughout the country. The DeCesaris Cancer Institute at Anne Arundel Medical Center, Johns Hopkins Cancer Center, the Massachusetts General Hospital Cancer Center and Fox Chase Cancer Center Temple University are a few of our nominating partners. The Stage 4 Breast Cancer women and their families are chosen regardless of religion, race, ethnicity, and age. 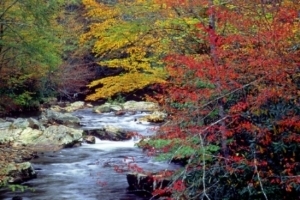 Sevier County Tennessee is in the foothills of the Great Smoky Mountains and is visited by more than 12 million people a year. It is the most visited and oldest National Park in the land management system. This beautiful place has become our primary summer vacation venue. It is where Dolly Parton was born and raised and where her famous Dollywood Theme Park, Splash Country Water Park and DreamMore Resort are located along with Gatlinburg and Pigeon Forge, which are known for their family values and family entertainment. It is a hub of vacation activity and attracts families from the South, Mid-Atlantic, and Northeast regions. This is where LESLIE’S WEEK was founded. This is where LESLIE'S WEEK vacations in August of each year. The specific criteria for our Educational Assistance program is that each child must have participated in our LESLIE’S WEEK program with their Stage 4 Metastatic Breast Cancer mother and family. They must be between the ages of birth and 12 during their vacation. They become eligible when their Stage 4 mother succumbs to her breast cancer. The Educational Assistance program is available upon graduation from High School and acceptance to a school of higher learning. The amount designated for Educational Assistance to LESLIE'S KIDS is determined on an annual basis and can fluctuate according to the amount of charitable donations received by LESLIE’S WEEK. Educational Assistance is in the name of the child’s mother and delivered directly to the school chosen by the recipient. "When in doubt as to what you should do, err on the side of giving."